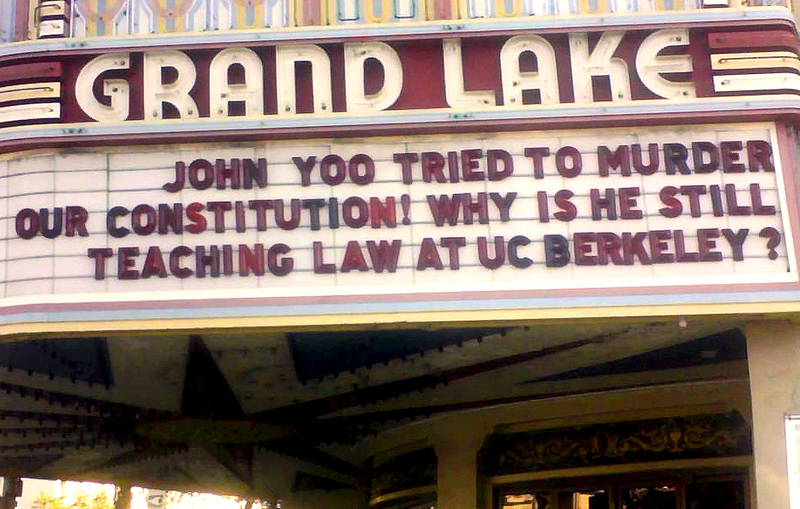 Whether Effort to Postpone Kavanaugh Vote Succeeds, or Not, We Can't Wait to Repudiate His Hate Fueled Agenda - FIRE JOHN YOO! Senator John Kennedy's lobby for confirmation of Trump's nominee defies the conscientious objections of millions of Americans who Refuse to Accept a Fascist America. 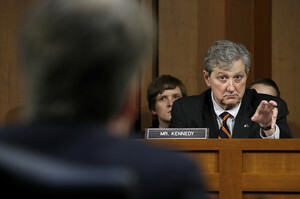 Calling the confirmation process "an intergalactic freak show," the Louisiana Republican predicted a Judiciary Committee vote to advance Supreme Court nominee Brett Kavanaugh would proceed as planned on Thursday, reports POLITICO producer Caitlin Oprysko. Sexual assault allegations against the nominee have inspired Congressional lawmakers to delay the confirmation process "until, at a very minimum, these serious and credible allegations are thoroughly investigated," says Senate Minority Leader Charles Schumer. [Ford] alleged that, during an encounter at a party, Kavanaugh held her down, and that he attempted to force himself on her. She claimed in the letter that Kavanaugh and a classmate of his, both of whom had been drinking, turned up music that was playing in the room to conceal the sound of her protests, and that Kavanaugh covered her mouth with his hand. She was able to free herself. Although the alleged incident took place decades ago and the three individuals involved were minors, the woman said that the memory had been a source of ongoing distress for her, and that she had sought psychological treatment as a result. We don't need, or want, to disqualify a Supreme Court nominee short of a comprehensive accounting for the candidate's history of assault on human rights -- including the right of a woman to not be raped. "It's not just that Kavanaugh would eviscerate women's fundamental right to decide for themselves whether to bear children -- which alone would be reason enough for millions to rise in massive political revolt," poses RefuseFascism.org. "With Kavanaugh, the Supreme Court would be a rubber stamp to the whole Trump/Pence agenda: shredding the separation of church and state in favor of Christian fascism against women, LGBTQ people, science, and the environment; backing xenophobic ethnic cleansing of immigrants and terror against Black people to 'Make America WHITE Again'; eviscerating civil liberties, the separation of powers, and the rule of law; unleashing even more vicious torture and military aggression against people of the world. Kavanaugh's confirmation would threaten the protection of fundamental human rights, including the right not to be tortured, says Political Science professor Jamie Mayerfeld. The composition of the Supreme Court may determine whether Donald Trump or a future president could act on Trump's promise to "bring back waterboarding and ... a hell of a lot worse than waterboarding." Listed below are links to blogs that reference this entry: Whether Effort to Postpone Kavanaugh Vote Succeeds, or Not, We Can't Wait to Repudiate His Hate Fueled Agenda. This page contains a single entry published on September 16, 2018 2:23 PM. Supreme Court Nominee Brett Kavanaugh Lobbied for Appointment of John Yoo to 9th Circuit Court was the previous entry in this blog. Since When Is the FBI Your Friend? is the next entry in this blog.